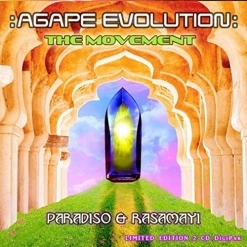 Agape Evolution: The Movement is a two-disc set from sound healers Paradiso & Rasamayi. 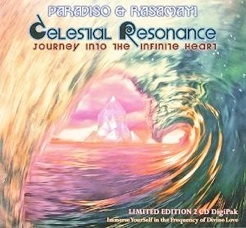 With a total playing time of more than two hours, the album is instrumental new age music that features Paradiso on digeridoo (both traditional and crystal), crystal tuning forks, keyboards, hand drums, hammer dulcimer, harmonium, tampura, and throat singing along with Rasamayi’s seed mantra chanting, gem- and mineral-infused Alchemy crystal singing bowls and crystal digeridoo. As they recorded, mixed and mastered the album, the intention was revealed “that humanity, on the individual and collective levels, could integrate the lessons behind our shadow nature and thereby leap forward in evolution. These vibrations are intended to facilitate our more perfect embodied expression of Agape, or divine love…. Each song was recorded with the intention to facilitate healing and transformation on all levels through the healing power of sound.” Agape Evolution provides an ideal soundtrack for meditation as well as deep relaxation and the massage arts. It is interesting to note that the Paradiso & Rasamayi play the world’s largest and second largest crystal digeridoos (named Sage and Ajini). Disc 1 is subtitled “Integrate” and is made up of eight tracks that are an ambient mix of vibrational sounds, wordless vocals and the various instruments mentioned above. Ethereal and often other-worldly, there is a very relaxing and contemplative vibe that could also be useful in treating insomnia (that comment is not intended to be insulting - it is what it is and the music could easily soothe a busy mind into a more relaxed state that would welcome sleep!). Disc 2 is subtitled “Ascend” and has seven ambient tracks that are both earthy and ethereal. The drone of the digeridoos and the hum of the singing bowls combine with keyboard instrumentation and human voices for a unique combination of sounds and healing vibrations that are both soothing and uplifting. Some of the music on this disc is more rhythmic than Disc 1, but most of it is very ambient. 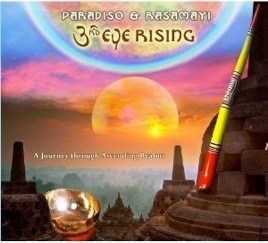 Agape Evolution debuted on Billboard Magazine’s New Age Chart at #9 and is Paradiso & Rasamayi’s fourth album together following 3rd Eye Rising (2011), Attuning to Oneness (2013), and Celestial Resonance (2015). Each of their previous albums has topped its genre’s international radio charts, and they have won four Best Album of the Year awards (Best Frequency and Transformation, Best Meditation and Relaxation, and two Best New Age Album of the Year awards). Agape Evolution: The Movement is available from Amazon, iTunes and CD Baby.